Skytop Miscellaneous - Mysteries, Models, & More!! Models - there are scale models of Skytops out there. Pictures of known models, ideas on how to make your own Skytop models, and more. Build a model of your favorite Skytop and send us some pics! Videos - links to YouTube videos of vintage Studebaker TV commercials with Skytops!! Included are videos of '61s, '62s, and 63s. Click HERE to go to the list. Miscellaneous - C'mon, what do you have? For sale ad in the November 1982 Turning Wheels. Car was modified, but looks pretty good in the picture. It would be hard to believe that this nice of a car has not survived. Does anyone know the owner at that time, Will Gish of West Covina CA? This car was sold on eBay auction 4579394019 by seller "kevineugenius"; purchaser was "studeshark"; auction end date Sep-30-05; price $560. 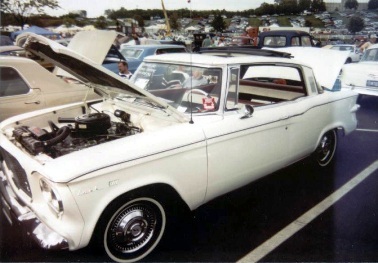 Leonard Shepard took a picture of this car in 2001 at the Hershey PA show. White with black Skytop, V8, looks mostly stock except maybe for the interior. 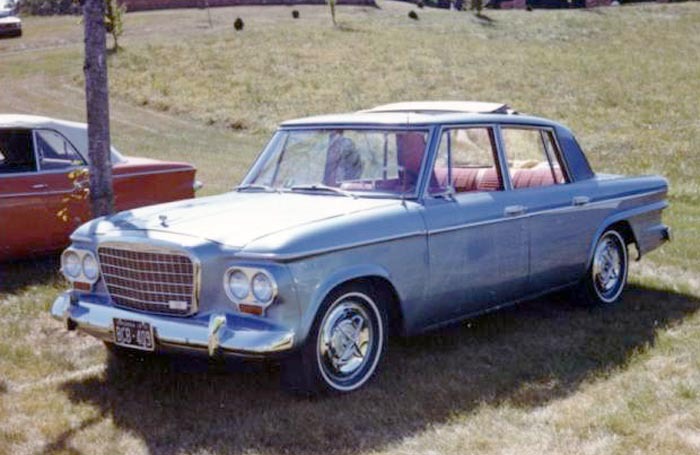 These really neat pictures were taken in the 1970s (check out the rare-today Aero-Strut hubcaps) in southern Virginia by Leonard Shepard. This car has to be one of the prettiest Skytops built, and would be a great car to own today. Someone obviously cared a lot about this car in the '70s, so hopefully it still exists, just waiting for some Skytop fan to uncover it. This car has been found! Well, not exactly found, because George Hamlin has known where it was for years. 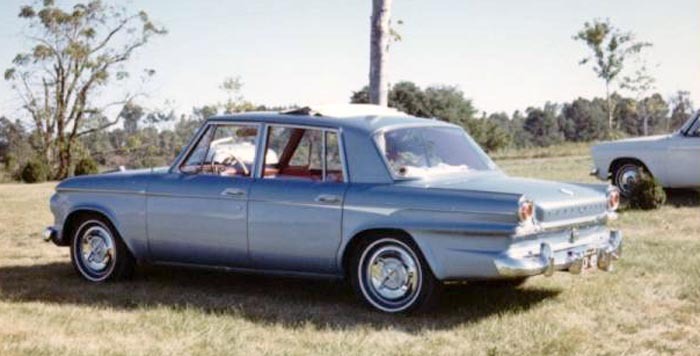 In a December 2018 email, George informed us that this car is his '63 Custom 4-door serial number 63S 25066. George wote: "You do know that the blue job with Virginia plates.........is now my red one, yes? Ex-Bob Robb of Virginia, now it's red and living in Maryland." See more about George's Skytop on the HERE. 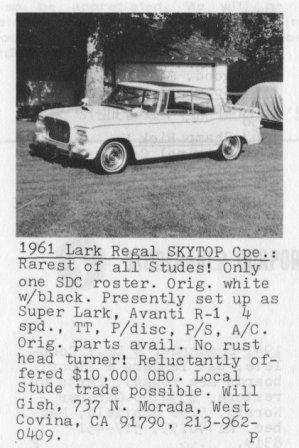 1960 Lark hardtop.........FOUND!! FOUND!! FOUND!! On March 14th, we received an email from Scott Rodgers of Los Angeles CA: "The Lark in that picture is mine!! 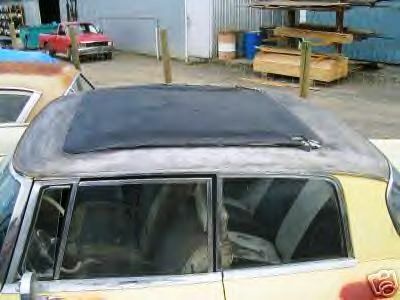 It's a 60 hardtop with a canvas ragtop from Street Beat Customs. The car is a project I've been working on for a number of years. It's still not complete - it's been in storage for a while. I’ve since removed the third brake light and door handles – those two things worked much better in concept than they did in actual practice. In fact, Troy Ladd from Hollywood Hotrods gave me a great suggestion – using the original door handles along the door body line. Anyway, back to the Skytop connection. I wanted to do an updated version of a Skytop after I saw an ad for the Street Beat Customs shop site. They make self-installed kits in custom sizes for any vehicle. I did some research on the Studebaker version of the Golde top and used the same dimensions to order the new ragtop. At the time, I paid just over $400 for the kit, but I know they are more than that now. 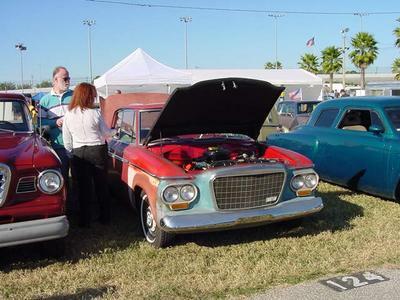 I stumbled on the picture of my car because I was trying to find a picture of a 64 Stude with the Golde top – I’m thinking about doing a ragtop on a 66 Daytona I have. I figured you guys would have one! And now you know the rest of the story." Just below is the pic of Scott's car that we originally had posted, and then below it is a picture of the highly modified dash board. That cyclops speedometer (from a '56 thru '58 Stude we think) really looks cool. Looking forward to seeing this completed Scott! This was provided by Mike Bostedt, and obviously taken at a car show. 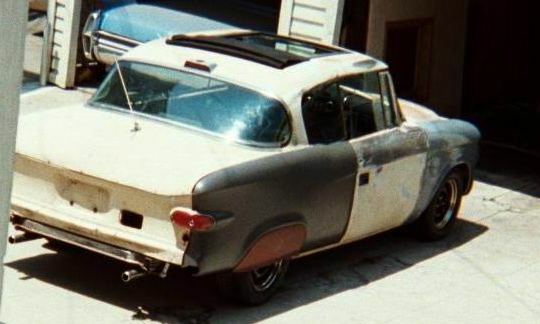 Picture, taken in late 2002 (according to picture properties), shows a mostly red car with blue nose and primer on lower portions of front fenders.